Yosemite Falls, seen here from the 4-Mile Trail, is 2,425 feet (739 meters) high - nearly half a mile from top to bottom. The lower falls alone, which you practically need a magnifying glass to see in this photo, is 300 feet (90 meters) high - as tall as a football field is long. 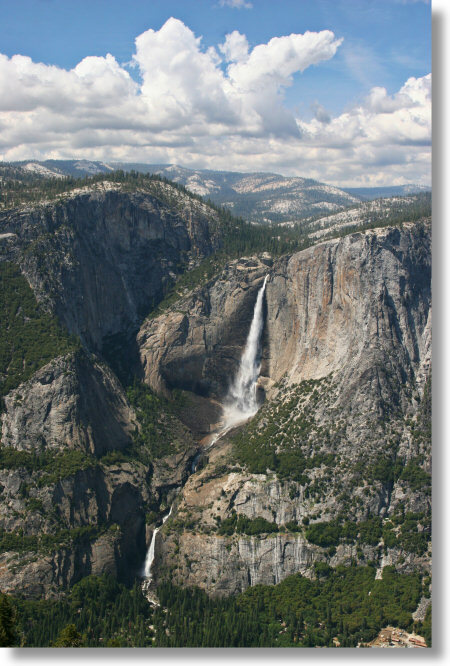 Yosemite Falls is the tallest waterfall in North America. Two trails lead to Yosemite Falls. The lower falls trail is short, easy, and nearly flat, ending up at a bridge across Yosemite Creek below the falls. Though you can't make it out in this photo, the bridge's location is visible near the bottom of the photo. The upper falls trail is considerably more challenging. It starts out offscreen to the left, enters the photo just under halfway up (the trail follows the horizontal band of greenery second from the bottom), then proceeds up the ravine to the left of the falls to an overlook right at the lip of the falls. Both trails are worth the effort.